"This Summer A Star Falls. The Chase Begins." 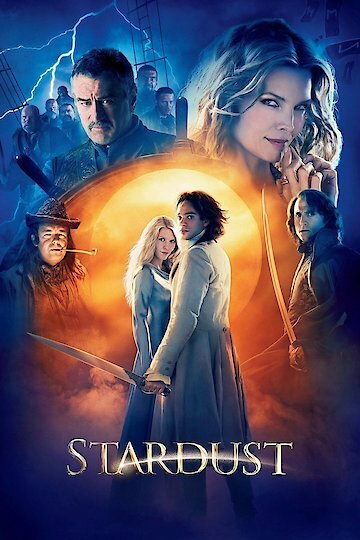 Released in 2007, Stardust is an American-British romance adventure movie inspired by the Neil Gaiman's book of the same title. The move cast includes Charlie Cox, Claire Danes, Michelle Pfeiffer, and Robert De Niro. Narrating the movie is Ian McKellen. A budget of $88.5 million was spent for making the movie. Stardust grossed $135.5 million at the box office. The film runs 122 minutes. The plot is set in the English community of Wall nested within a stone wall and bordered by a mystical place called Stormhold. A guard is assigned a post at a broken part of the wall to prevent people from passing through and entering the forbidden and unknown area. Starting the story, Dunstan Thorne passes over the border and into a market. There he finds an imprisoned princess named Una. She trades Thorne a glass snowdrop for his kiss. Nine months pass, and the Wall Guard sends a baby to Dunstan, saying his name is Tristan. Another 18 years pass, and the ruler of Stormhold is shown lying on his deathbed. Before he dies, the king throws a precious gem into the sky, announcing that whoever of his sons is the first recover it will be crowned the new ruler of Stormhold. While in the air, the precious gem is hit by a star, combining the two elements as they fall somewhere in Stormhold. The ruler's two remaining children, Primus and Septimus independently look for the gem. Back in the village, Tristan grows to be a fine young man with the skills of a swordsman. One night, he witnesses the star dropping behind the wall. He vows to retrieve it for his love, Victoria, in exchange for her approval to marry. Before leaving, Tristan's father discovers that his mother is from Stormhold. After sneaking beyond the wall, Tristan finds the fallen star in the form of a woman, later revealed as Yvaine. Stardust is currently available to watch and stream, download, buy on demand at Netflix, Amazon, Vudu, Google Play, FandangoNow, iTunes, YouTube VOD online.